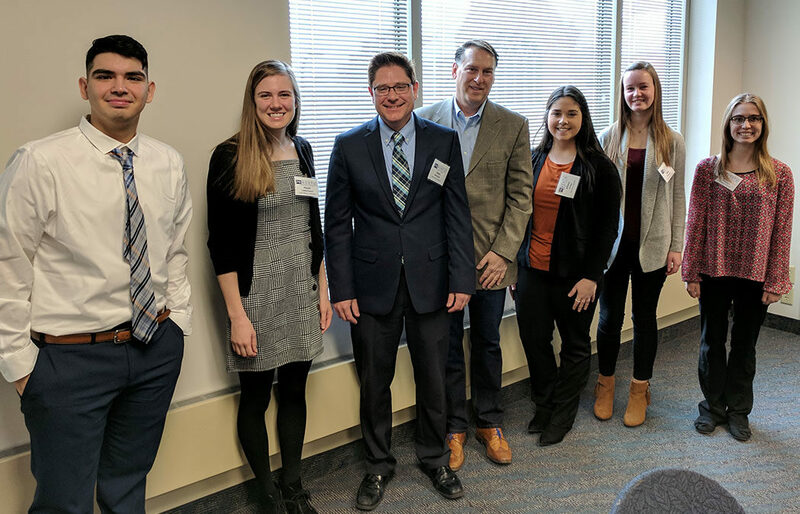 Students in the Public Relations/Business Club attended the 2019 PR North Conference in Minneapolis on Feb. 9, hosted by the Minnesota Chapter of the Public Relations Society of America (PRSA). Students met Minnesota Chapter PRSA president and Saint Mary’s alumnus Greg Zimprich ’86, attended sessions on media relations and influencer relations, learned how to negotiate a job offer, and participated in a job fair and mock interviews. Photo caption: Attending the PR North Conference were, from left: David Gutierrez, Heidi Ledermann, Dean Beckman (faculty adviser), Greg Zimprich ’86 (Minnesota PRSA president and Saint Mary’s alumnus), Allie Grengs, Kelly Ferguson, and Morgan Prokosch.